The Masters of Reality return - Black Sabbath regroup to headline Download 2012 along with Metallica! "Legendary", "Pioneering" and "Seminal" are expressions bandied around all too easily when it comes to describing musicians, songwriters, bands and artists. I heard someone on the train describing X-Factor as pioneering. I had to get off, I was that perturbed - but those descriptions are worthy exclamations when it comes to Black Sabbath. Formed in the late '60s, the original line-up of Ozzy Osbourne, Tony Iommi, Geezer Butler and Tony Ward, pretty much wrote the text-book labelled, 'Heavy Metal'. Not just metal with loud guitars but metal with doom, death and destruction in its veins - the blueprint for all other metal bands to arguably follow. Sure, Deep Purple and Led Zeppelin were also making waves and aiding sales of dark clothing, but it was Sabbath who stuck with their roots and continued their unstoppable journey with a string of classic albums. So what better way to cheer up a Sabbath fan, than for the original starting line-up of Osbourne, Iommi, Butler and Ward to reform! Not only that, the rejuvenated lords of darkness will be headlining Download 2012 on the Sunday - woooaah, that's going to shift a lot of tickets VERY quickly! And, with the promise of new material looming on the horizon (their first since 1995's "Forbidden"), demand for Download looks to head skyward. We will have Early Bird weekend tickets for next year's Download at 2011 prices on sale from Friday morning at 9am. These tickets will remain on sale until midday 30th January 2012 - prices will then rise to full 2012 values from 5pm on the same day. E.g. - 3 day admission with camping will be £170, but only until 30th Jan. Need further convincing? Their biography shouts for itself - from 1970's self-titled debut containing "N.I.B." 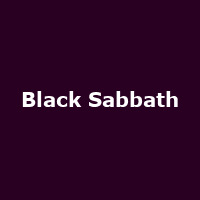 (Nativity in Black), through the sophomore "Paranoid" with it's Motorik title-track and other signature songs, "Iron Man" and "War Pigs", past the stoned out "Master of Reality" set and up to "Sabbath Bloody Sabbath" in 1973 and "Sabotage" in 1975, Black Sabbath were at the top of their tree. The late '70s up to the mid '80s were packed full of decent releases, although some would argue their fires from Hell may have stopped burning by 1989's "Headless Cross", probably due to the umpteen line-up changes and various clashes. But now the originals return in a blaze of unbridled darkness and their ONLY UK festival appearance for 2012. Oh, and some other band called Metallica are performing at Download 2012 on the Saturday - what a way to celebrate the festival's 10th anniversary! !